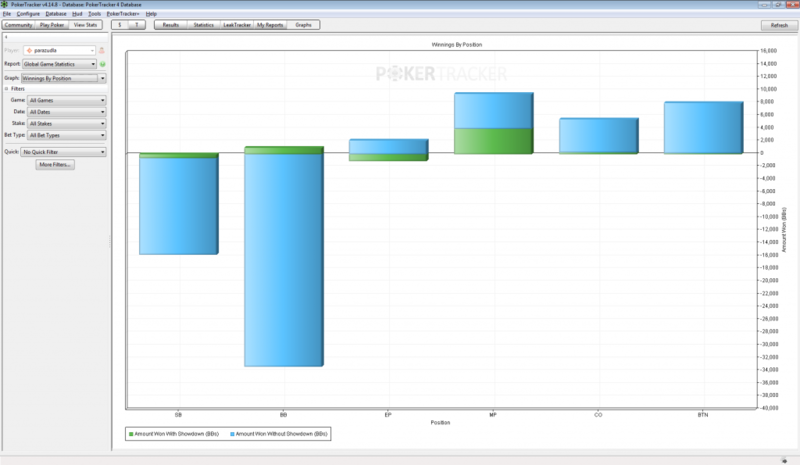 Poker Tracker 4 has several tools for work with ICM, such as “ICM Quiz” and “ICM Calculator”. Let’s consider them separately. 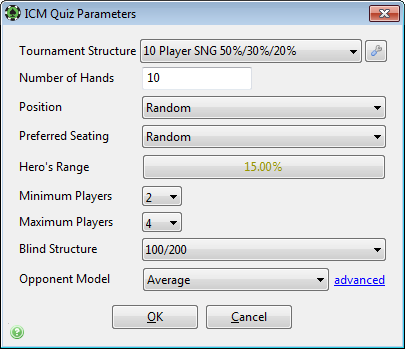 “ICM Quiz” is designed to train playing skills to Independent Chip Model. You can find “ICM Quiz” in “Tools” in main menu, and choose “ICM” and “Quiz”, like on the picture below. In the opened window you can set up the varied parameters of the game situations, which you want to train. In “Tournament Structure” you can choose structure of tournament. 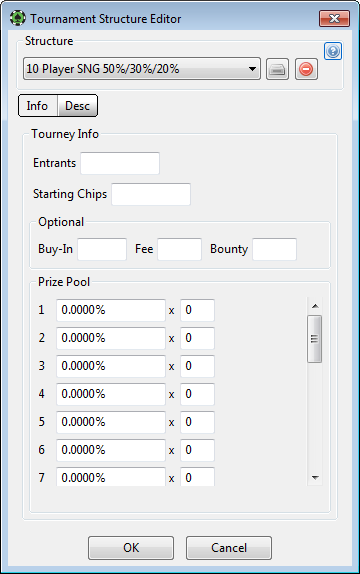 There are several templates with tournament prizes structure, such as “10 player SNG 50%/30%/20%”, “10 players DON”, “2 Player 100%” and others. Also you can create your own prizes structure by pressing relevant button. 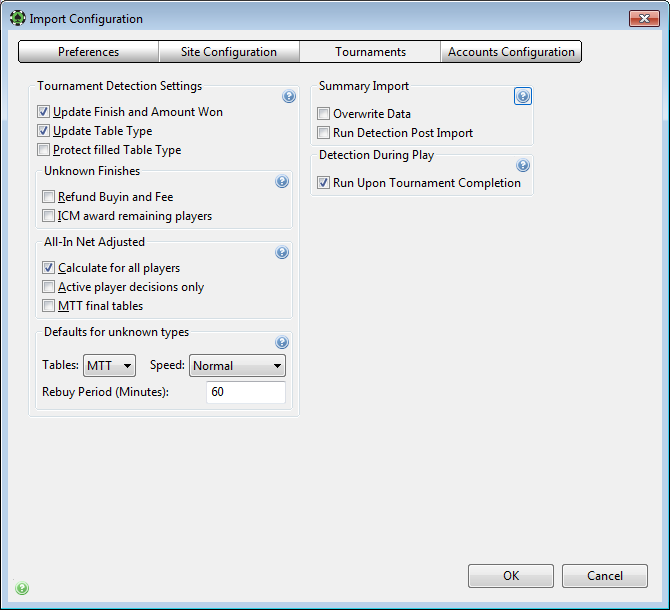 In the opened window you can edit and remove the existing tournaments types, and you can create your own tournament type. To do so you have to specify “Tourney Info” и “Prize Pool” in “Info” tabs. On “Desc” tab you can indicate additional structure parameters, such as “Seats per Table”. 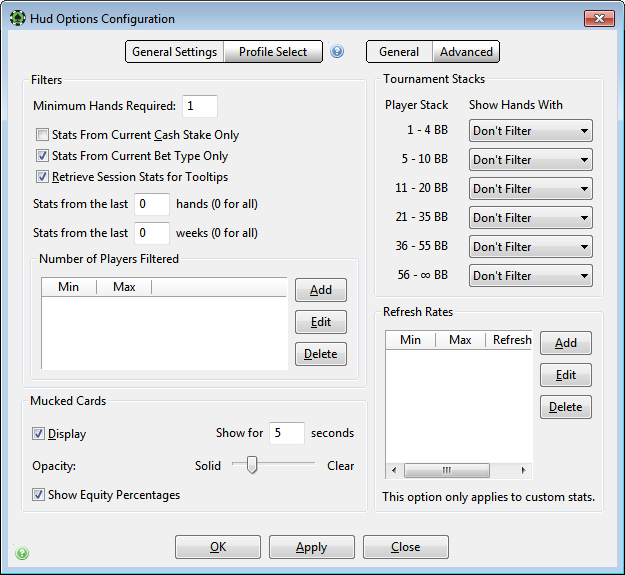 Here you can choose “Full”, “6max” and “HU” tables. 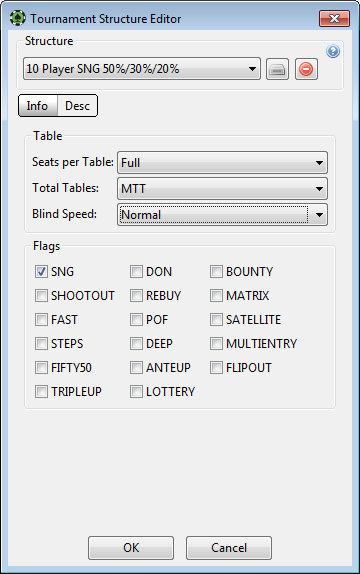 In “Total Tables” you can choose “MTT”, “SNG” or… In “Blind Speed” you can set up tournament table speed. 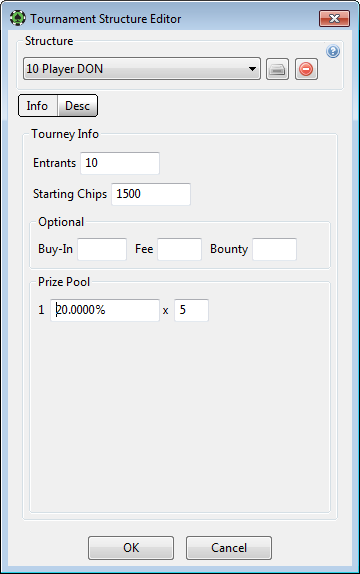 Also, you can mark flags for tournaments, such as “SNG”, “DON”, “REBUY”, “STATELLITE”, “DEEP” and etc. After all settings press “OK”. Let’s return to “Quez Parameters”. Here you can set up “Number of Hands” for you training “Position” which you want to train, “Preferred Seating” (не очень понятен смысл). In “Hero’s Range” you can set up range, which you want to train. For example, “AA” or “72”, it’s pretty easy decision in any position. You can remove it from range. Also, you can indicate Minimum and Maximum Players at the table and “Blind Structure”. You can also choose the type of opponent, which depend on the opponent range. With it opponent will close your “Open Push”. You can choose “Average”, “Loose”, “Tight” and etc. 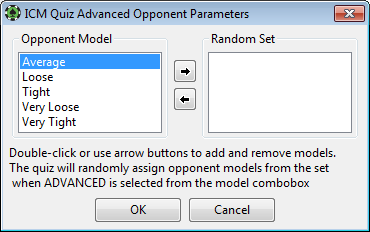 Click “advanced” to combine several kinds of opponent in one type. After all settings press “OK” and in each Replayer window choose “Push” or “Fold” answer, or press “Quit” for premature quit. After answer on all questions you will see the following window with the results. In this window you can see what was necessary to do in every situation and consideration of your variant with Independent Chip Model. Here you can make double-click to review hand. This section will be helpful to calculate the value of the stack according to Independent Chip Model. You can find “ICM Calculator” in “Tools” in main menu, and choose “ICM” and “Calculator”, like on the picture below. Here you can calculate Prizes in Pool% and in the Money. For calculation in $ you need to enter “Buy-In”, “Fee” and “Bounty”. Also, you can save or import “Player/Chips/Results” in .xml foramt. After entering parameters in “Info” and “Desc” tabs, press “Calculate” and you will see the following result (like on the picture). On this tab you can analyze your game through graphs. “Graphs” tab is located in “View Stats” section. 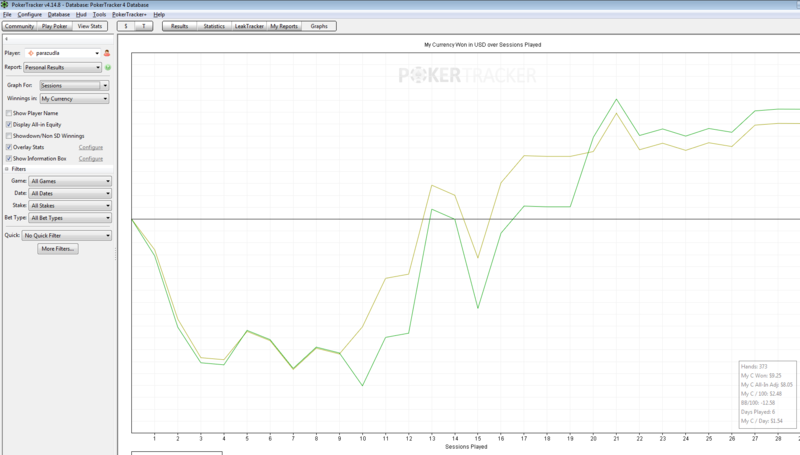 For example, let’s consider cash games graphs. In left side of the screen there is a field with player name. Below you can see “Report” list where we can choose reports to review. 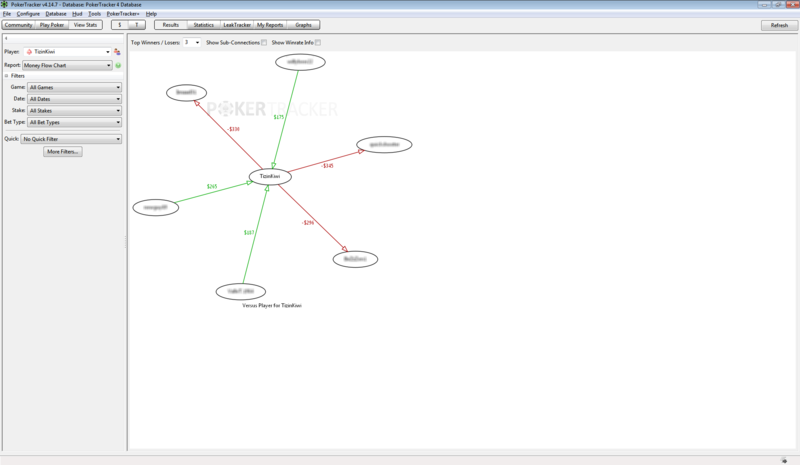 Also, you can choose “Graph for” like as “Hands Played”, “Dates”, “Months” and “Sessions”. 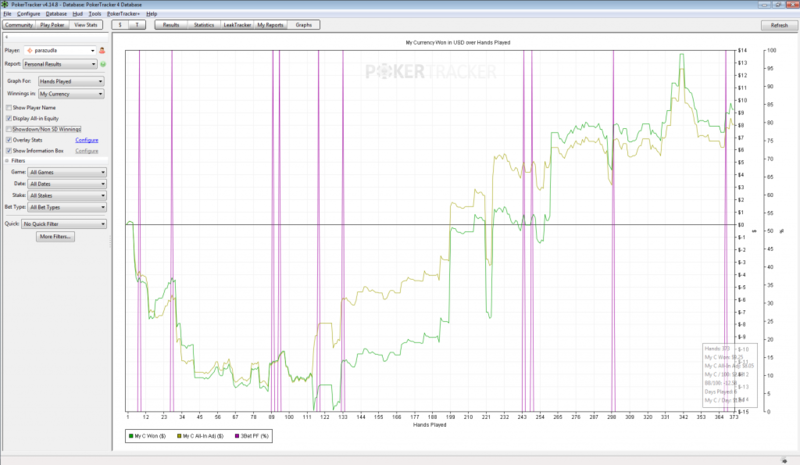 In “Winnings in” you can choose the display of the graph in “My Currency” or “Big Blinds”. Below, you can set up to display player name on the graph or not, “Display All-in Equity” or not, Showdown/Non SD Winning. Also, you can set up “Overlay Stats”. To do so press “Configure” and the following windows will appear. In this window you can add any stat from Poker Tracker 4. Also you can use searching. 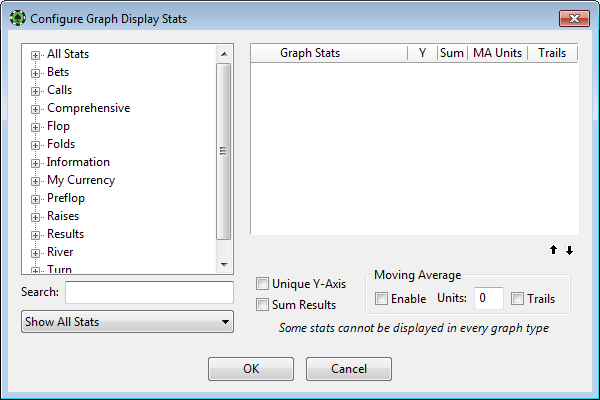 You also need to understand some stats cannot be display in every graph type. In “Show Information Box” you can set up information box, which is displayed in the bottom of the right part of the graph. Press “Configure” and you will see the following window. For add stats you have to select the stat in left side of the window and make double-click. You can use the search at the bottom. Also, you can filter stats in the list. For removing stat you have to make double-click in the right part of the screen. Below there are the arrows which allow to control displayed sequence. Alfter all settings press “OK” to save. Let’s return to our Report. In the bottom of the left part there are “Filters” and “Quick Filters”, they will be situated in each Report. You can read more about these filters in another part of our tutorial. 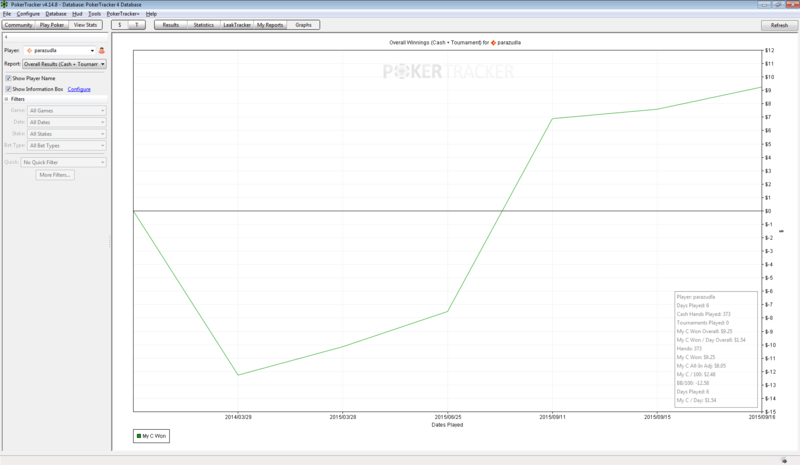 In the right side of the screen there is a graph, which shows our customized information. Report “Personal Results by Time Period” is comfortable to show the graph by “Hour of Day” and “Day of Week”. Report “Overall Results” (Cash + Trounament) looks like following. Report “Global Player Statistics” is usable to rate the selected statistic in the middle of the field. 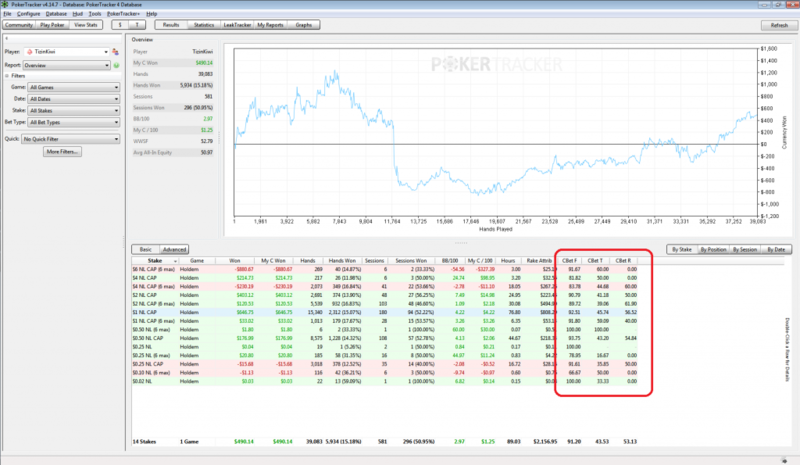 You can enter “Min Hands” and breakeven. You can understand how it is distributed on player pool and try to understand how it influences the profitability of the game. 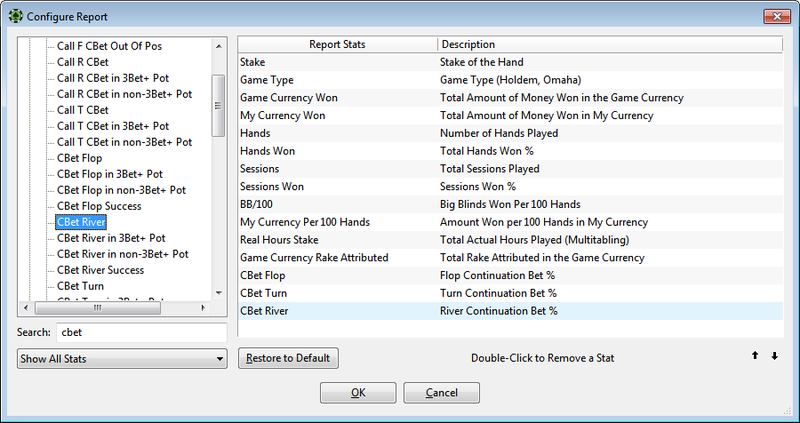 In Report “Global Post Flop Ranges” you can see how often different combinations on Flop, Turn and River of players from you database are gathered. Also, you can set up minimal amout of hands. The red dots indicate the losers. The green dots indicate the winners. 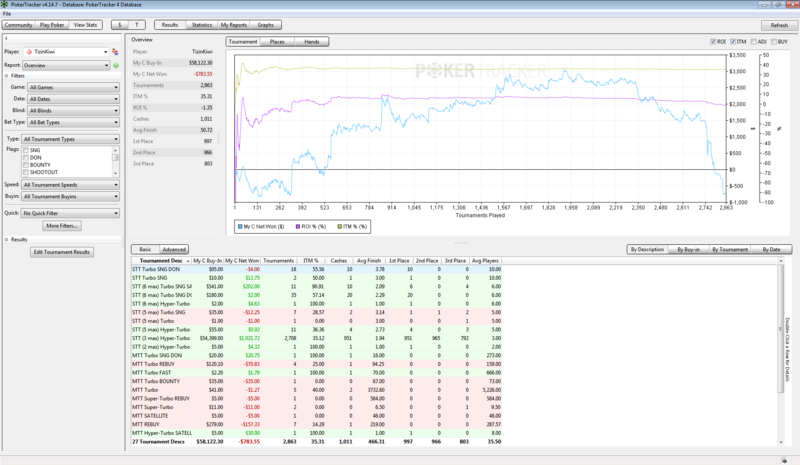 Also, you can set up “Min Hands” and breakeven. 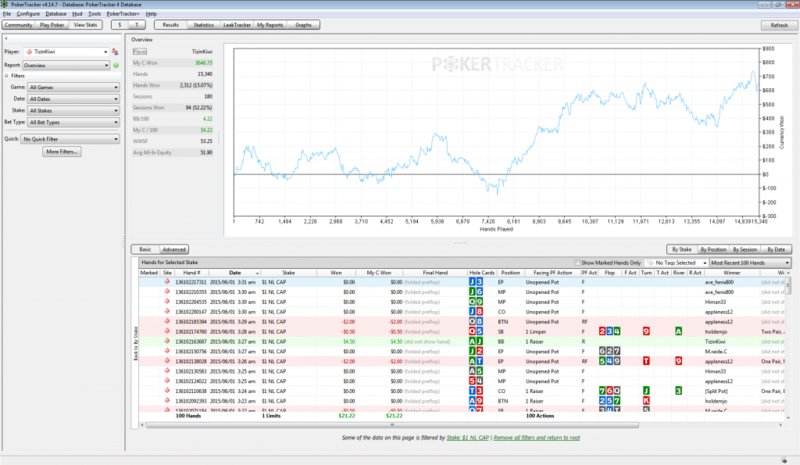 This tab is designed for setting Poker Tracker 4 for different poker-rooms. Also here you can set up hands import. In the left side of the screen you can make settings for each poker-room or poker network, such as 888 Poker, Full Tilt Poker, GTECH G2 (Boss network), iPoker Network, Merge Network, MicroGaming (MPN), OnGame Network, PartyPoker, PokerStars, Revolution Gaming Network, Winamax, Winning Poker Network (Yatahay). 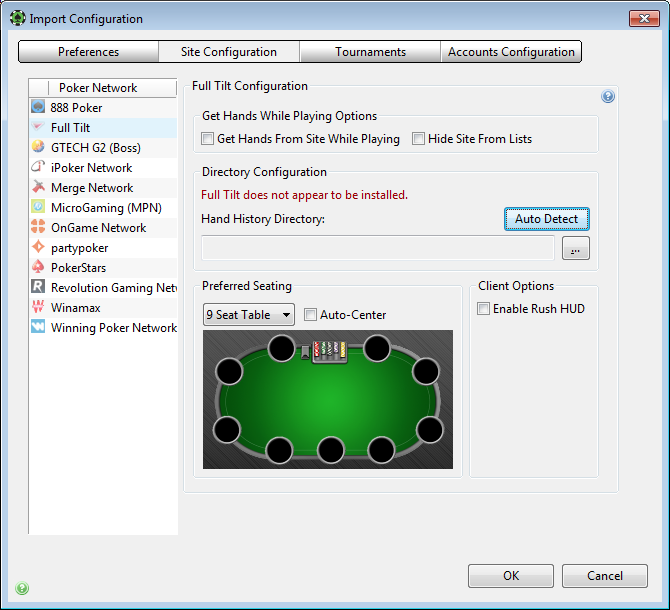 To go to the settings you have to double click on the chosen poker-room or select poker-room and click “Configure” button. “Launch” button opens poker-room client. For example, I choose PokerStars. In the opened window you can check off “Get Hands From Site While Playing” and “Hide Site From Lists” if you want. 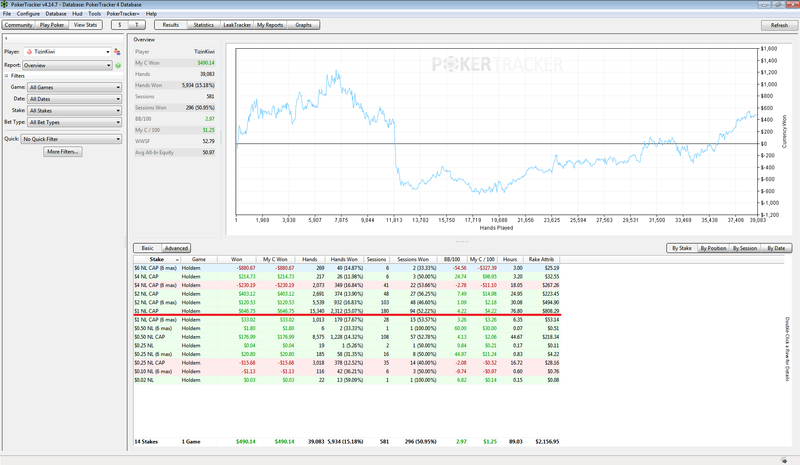 Below, you can set up folders for import hands, Poker Tracker will follow them. 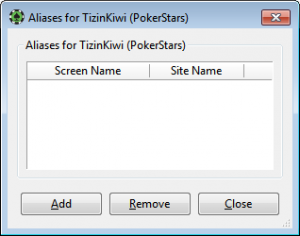 Here you can add, remove or auto detect folders, if you have correctly installed PokerStars client. Below, you can tune “Preffered Setting” for each type of the table. You can mark “Auto-center” parameter for seating. Also you can use “Memory Grabber” and “Zoom HUD” or not. 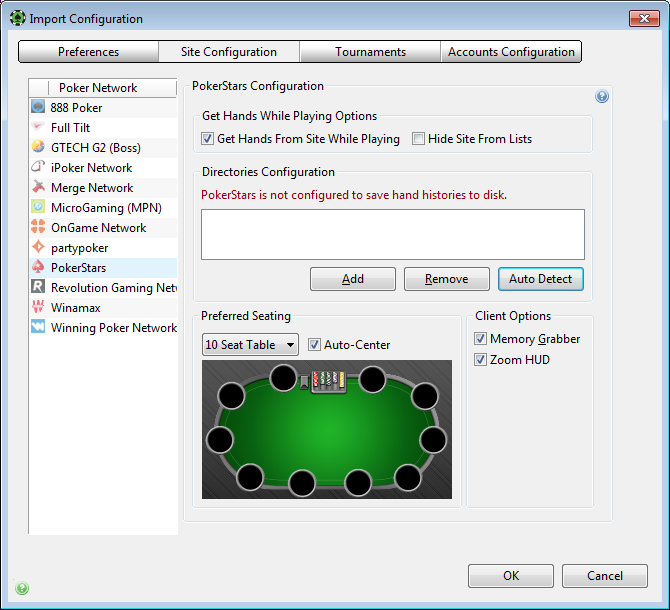 For other poker-rooms the settings may differ slightly. In other tabs of this window you can set up the following things. “Preferences” tab is designed for setting folders where “Processed Files” will be sending. Also, you can choose to split files into folders or do not by “Separate by Site”, “Separate by Date”. 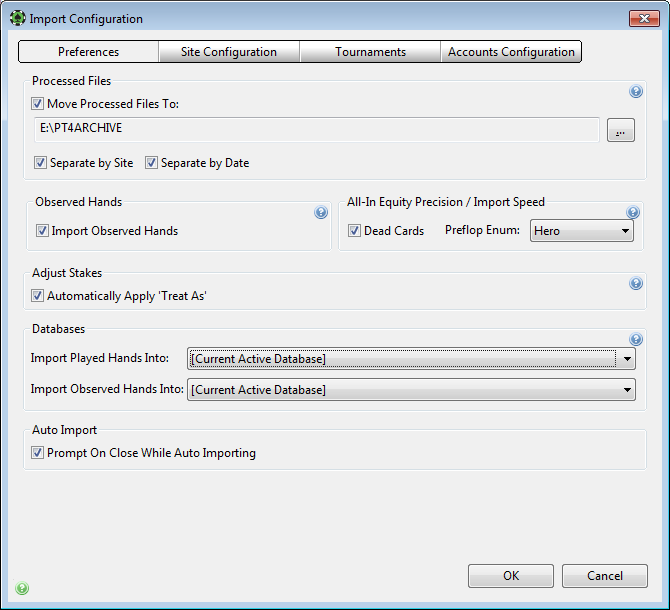 Also, you can indicate to import observer hands or not. 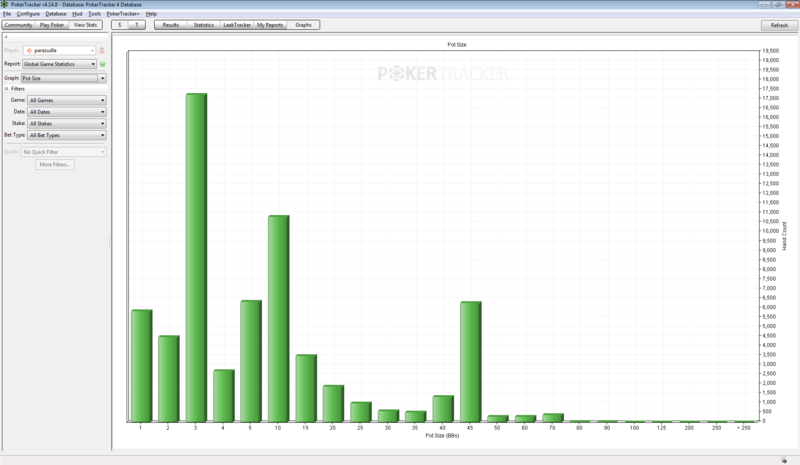 In “Databases” section you can indicate with what databases Poker Tracker 4 must work. Also, you have to specify “Auto Import” and “All-In Equity Precision” display affected on import speed. On this tab you can set up import of hands from your e-mail. Use the “Test” button for check if everything is working properly. 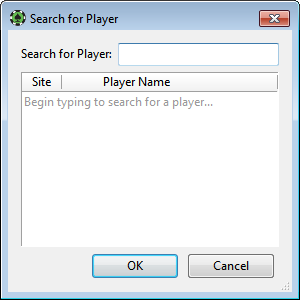 Let’s return to “Play Poker” tab. In the right side of the window you can import hands. 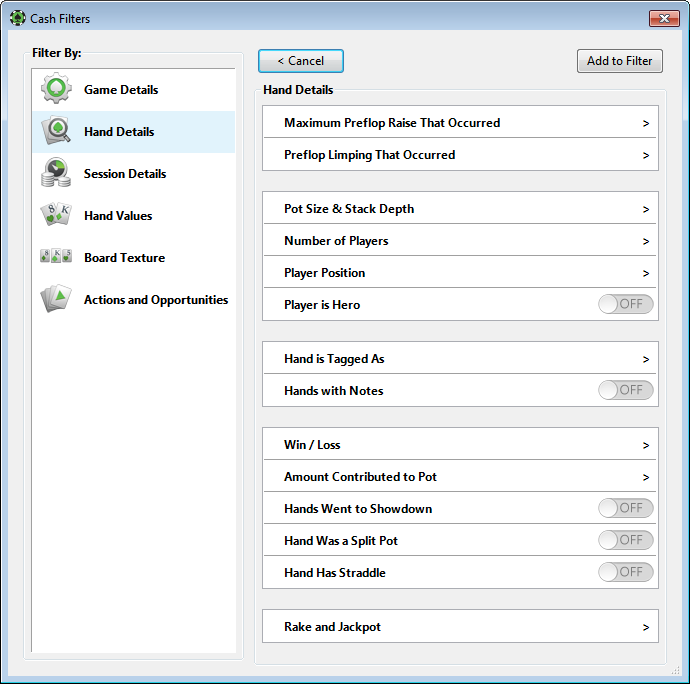 For this press “Get Hands While Playing” or “Get Hands from Disk” and select the desired folder. Or you can press “Get Hands from Email”, if you have set this method. Below, you can check off between tabs. View Today’s Hands” designed for comfortable view today’s hands. 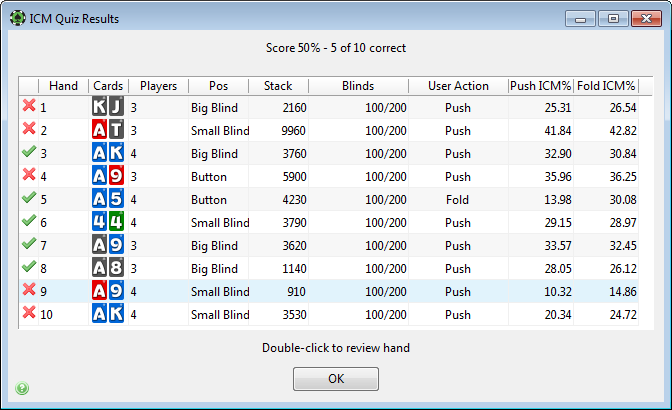 “Hands Summary”, “My Hands”, “$” and “T” tabs allow you to filter these hands. 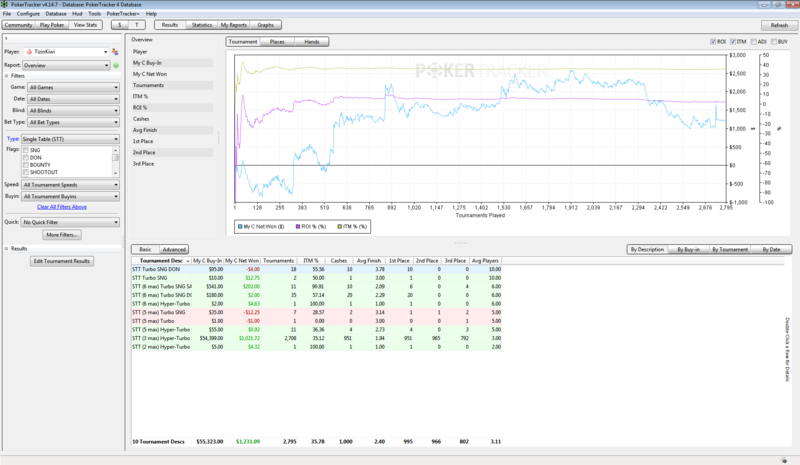 “View Active Tables” allow you to see each table you are currently playing on. 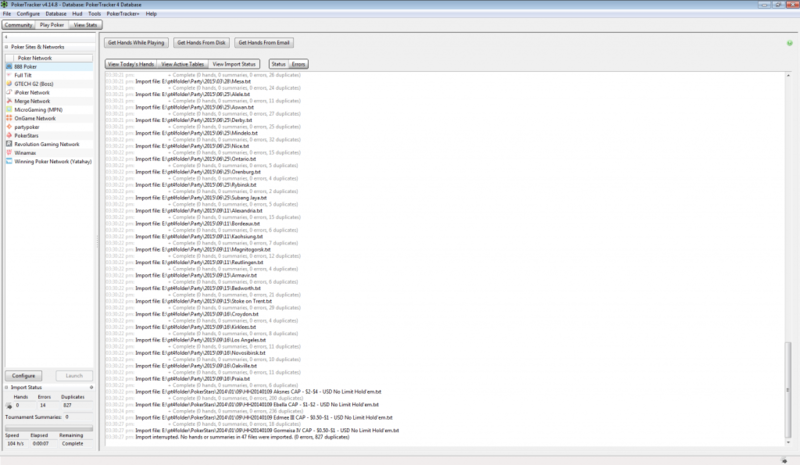 “View Imports Status” allows to import reports. 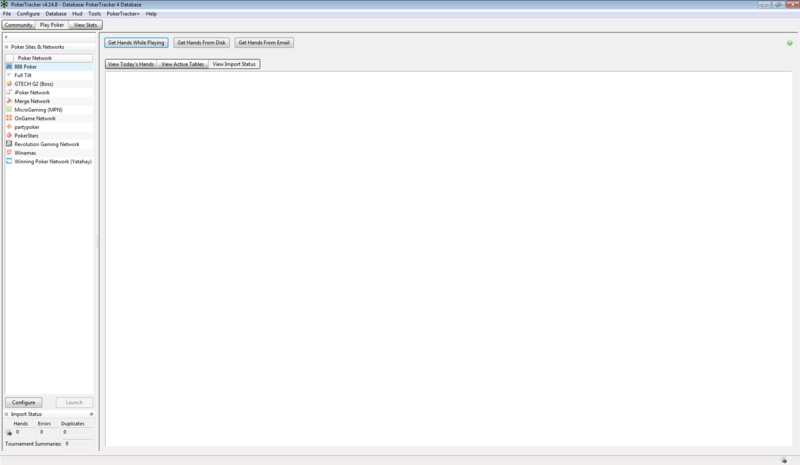 It will be empty if you import nothing after start Poker Tracker 4. If import took place, “Status” and “Errors” tabs appear. 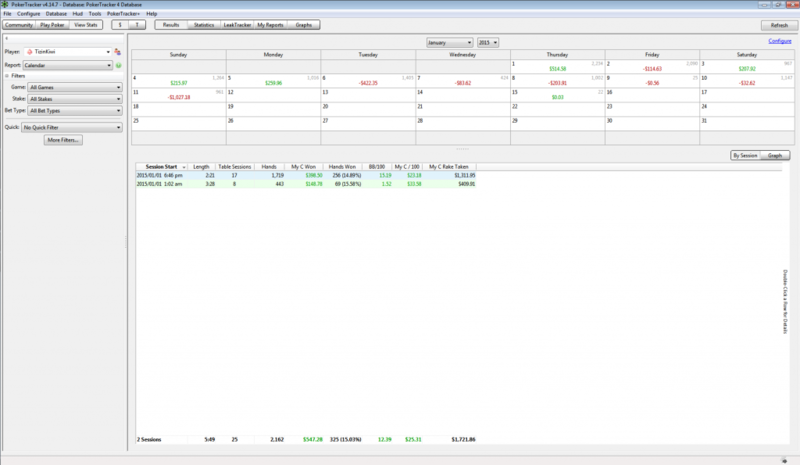 In these tabs you can review each action in details. In the left side of the screen you can find the additional information about importation, such as number of imported hands, “Speed”, “Elapsed” and “Remaining” time, and others. 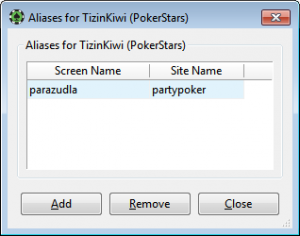 Aliases are one of the very useful functions in Poker Tracker 4. They are used for grouping your statistics for all your poker-room accounts in one Alias name. It is very conveniently if you play in several poker-rooms at the same time. Lets create own Alias, for this press “View Stats” tab and in text field enter you screen name, if this field is empty. Then press button like it is on the picture. Now you have to choose other your poker-room accounts which you want to add. In the popup window you can see the list of screen names attached to you first screen name, currently. 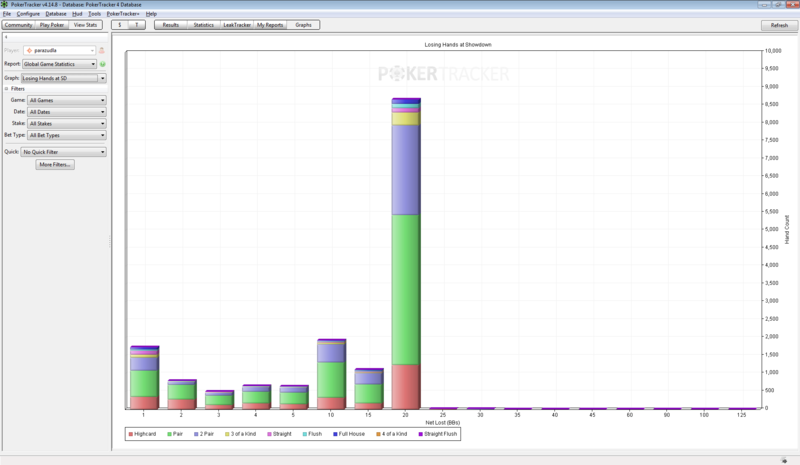 If you recently installed Poker Tracker 4, this list must be empty. Press “Add” to create new Alias. You must see the warning window with information about long time you’ll need if your database is large. Wait. After this, the screen name of your second account is appeared in the list, like on the picture. You can add more accounts if you have them. Also in this window you can remove all old screen names, if they are not needed. Press “Close”. As can you see, the icon changed its image; it shows a few names under this name now. Now you can make the fast switch between your Aliases and easy analyze your game. Perhaps, the most important window for analysis of the game in Poker Tracker 4 is the section “View Stats”. With the help of (By) “$” and “T” tabs you can switch between Cash and Tournaments games, respectively. 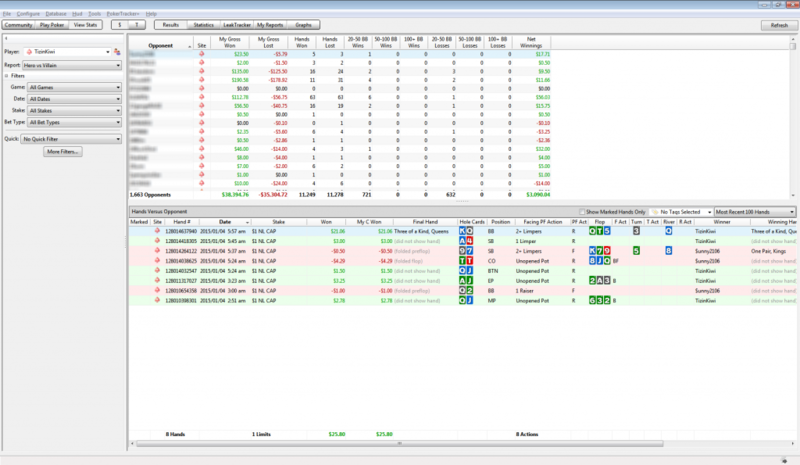 By the tabs “Results”, “Statistics”, “LeakTracker”, “My Reports”, “Graphs” you can analyze you game results. 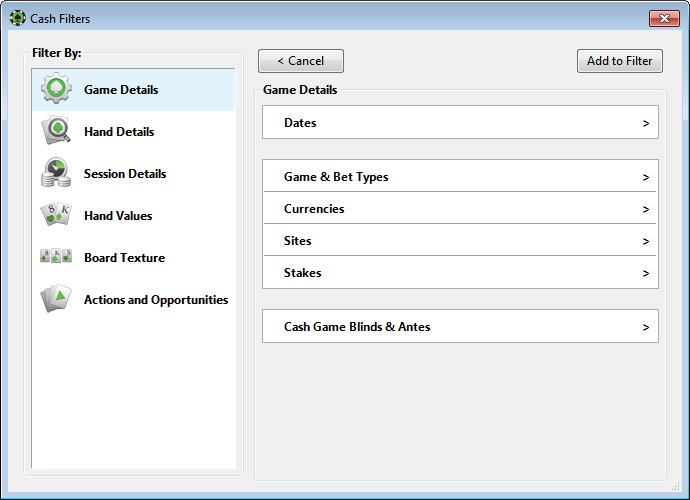 In this part, we will focus on “Cash” games and “Results” tab. It’s all quite simple. In the left part of the screen you can select “Player Name”, “Report Type”, “Filters” and “Quick Filters”. “Quick Filters” will be discussed in individual part. In the right part of the screen you can see graph of the selected report. Directly under graph you can report itself. In the dropdown menu, there are available the following reports “Overview”, “All-in Equity Adjusted”, “Summary”, “Calendar”, “Final hands at Showdown”, “Money Flow Chart”, “Hero vs Villain”, “Currency Exchange Rate”, “Player Summary”, “Site Summary”. Consider the most useful reports. In “Overview” report, in the top part of the screen is available the visual graph our database. 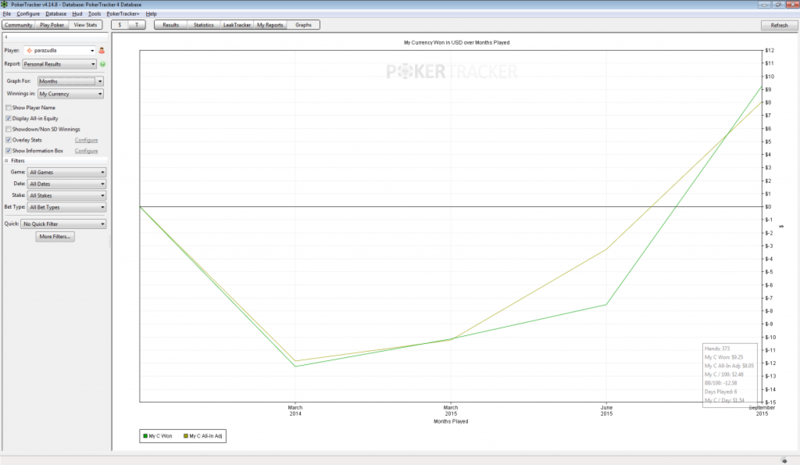 In the left part of the screen after establishing “Date” range in the filters, you can create “Active Session screen” functional from Holdem Manager 2. In the bottom part of the screen it is available “Basis” and “Advanced” tabs. Also you can sort your report with tabs “By Stake”, “By Position”, “By Session” and “By Date”. In “Calendar” report you can see the result of each day on the calendar and reveal some feature. For example, with this report, I came to the conclusion that Friday and Saturday are more successful days because usually there are more weak players in these days. 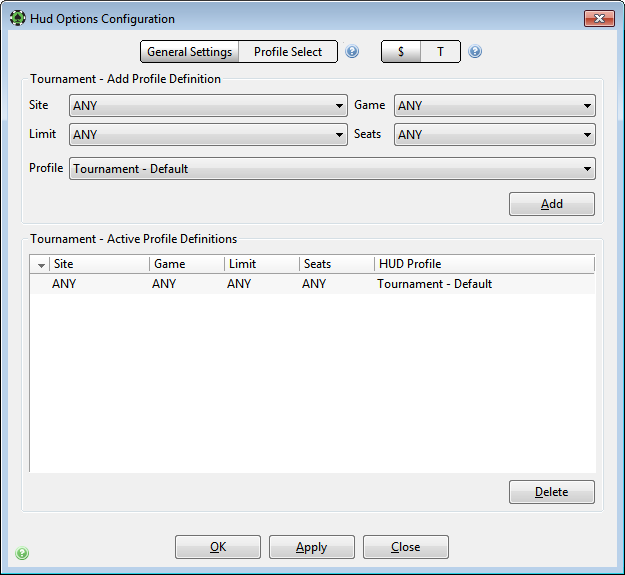 “Hero vs Villain” is the simplified analogue of “Opponents Tab” from Holdem Manager 2. 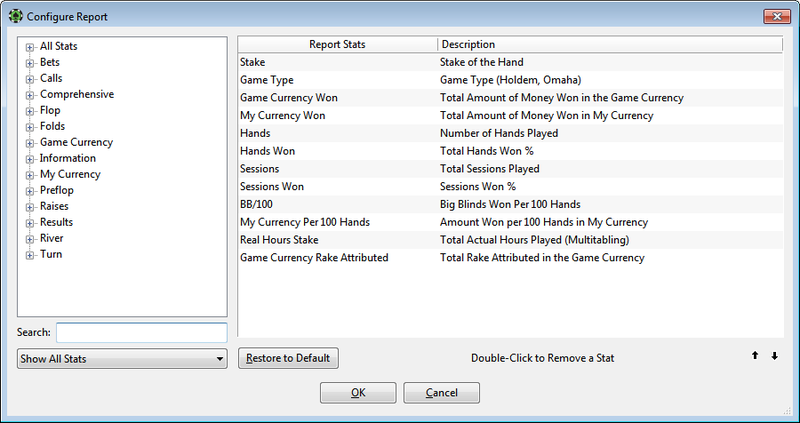 In the top part of the report you can sort all opponents by winning/losing money, by winning/losing banks, by amount banks in different stack sizes and by other parameters. In the bottom part you can see specific hands of selected opponent. 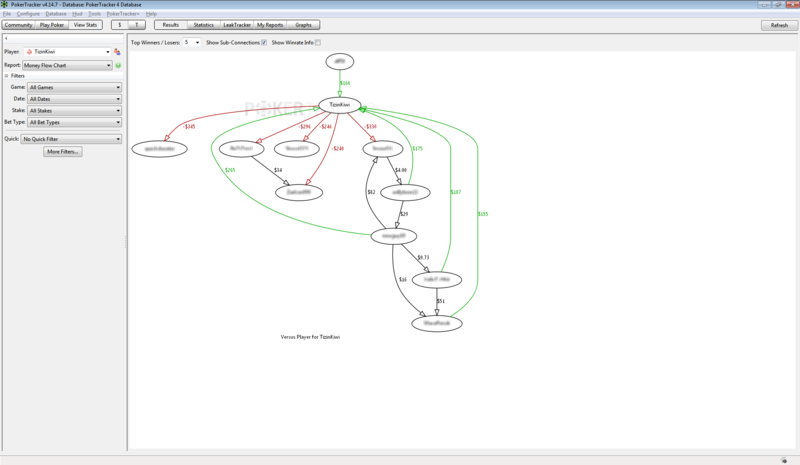 Also, “Money Flow Chart” can be related to the analysis of opponents. There is graphically showed who loses and who wins money. You can tune different number of players, “Sub-Connections” and “Winrate Info”. Be careful, “Show Sub-Connections” can take a lot of time. “Site Summary” suitable for the formation of a simple annual report. Also in the window of any report, you can make a right mouse click. In this window you can “Refresh” reports, “Change Active Player”, “Configure Report” and “Export Report” to *.csv or *.txt file. 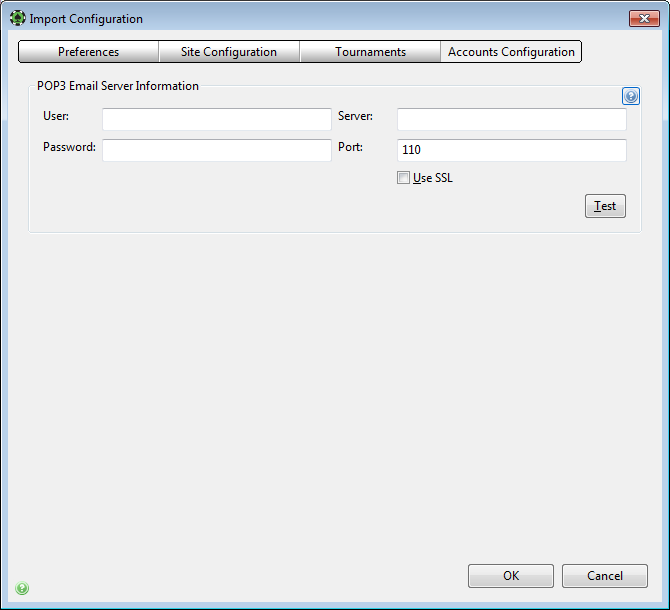 If you choose “Configure Report” the following window will open. In this window you can set up the report like you want, add necessary stats and remove unwanted stats. Also you can sort all stats as you wish. For addition necessary stat make double click on it in the left side of the window. Use search for fast searching stats. For removing unwanted stat make double click on it in the right side of the window. To return to the original settings press “Restore to Default”. To save the settings press “OK”. Now, the report should look otherwise, for example, I added these stats. Also, you can double click on the specific limit, like on the picture below. You can see the graph and your hands for this limit in the bottom side of the screen. 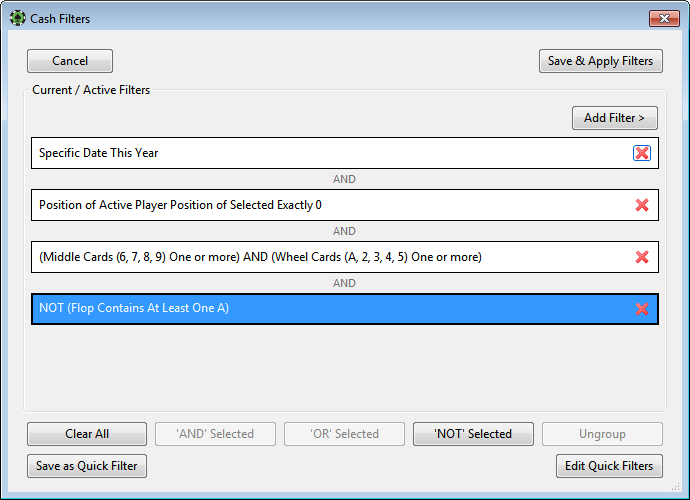 Filters are one of the most often used features of Poker Tracker 4. With filters you can analyze your hands database. For setup filters go to “View Stats” tab and press “More Filters” button. All functions are available in the popup window. Let’s go through the example of making ourselves filter. 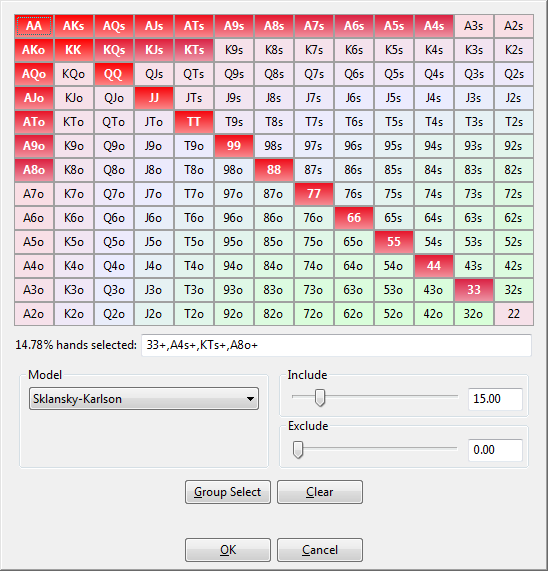 Section “Game Details” is designed for setting Date range, Game & Bet Types, Currencies, Sites, Stakes and Cash Game Blinds & Antes. For our example I chose data “This Year”. For this you need to go to “Dates” and to click “This Year”. Then press “Add to Filter”, if you don’t do this all our changes will be lost. Then the next window will appear. In this window you can see the list with all added filters with which you can perform various manipulations. Let us examine them later. 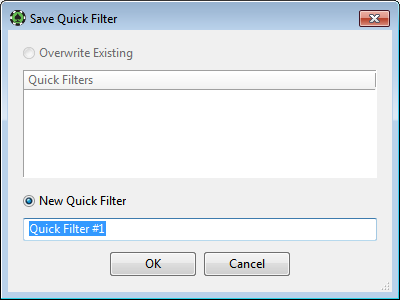 To continue, press “Add Filter”. “Hand Details”. This section is designed for setting various parameters. For example, let’s consider a situation where we are on BTN position and we call against opponent. 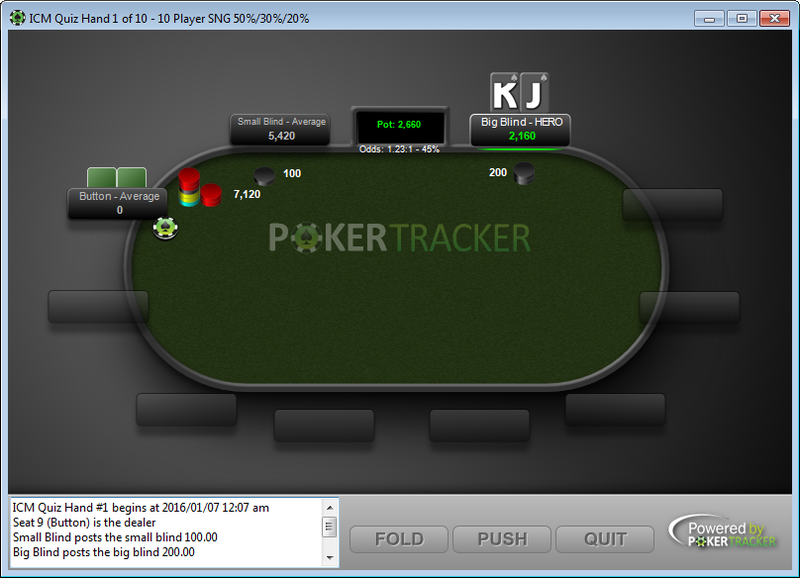 For this choose “Player Position – Preflop”, click on “Exactly” and input “0”. 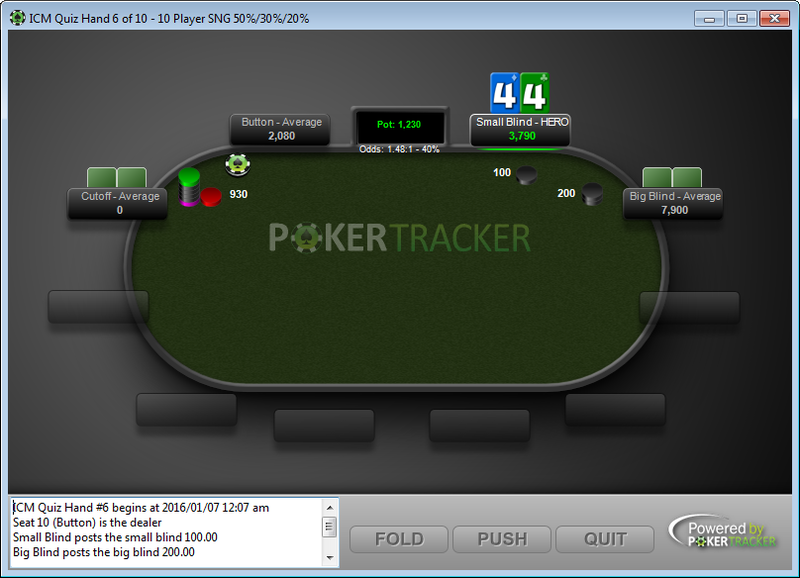 “0” means “Button” position in Poker Tracker 4, “1” means “Cut Off”, “2” means “Middle Position” and etc. 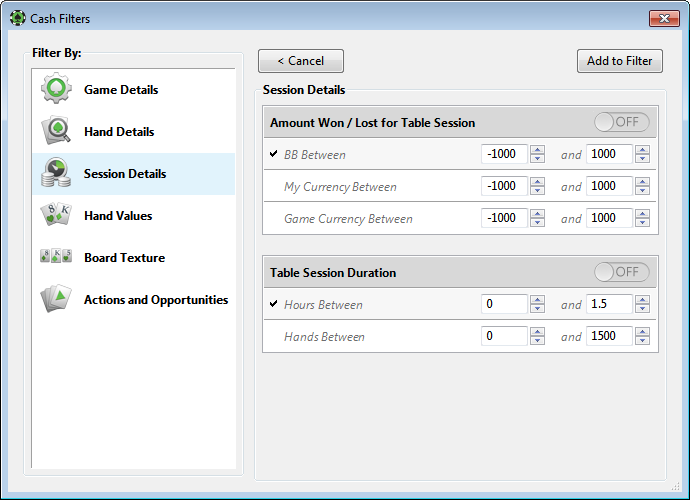 “Session Details” is designed for setting “Amount Won”/ “Lost for Table Session”, “Table Session Duration”. We will not choose anything in this section for our example. 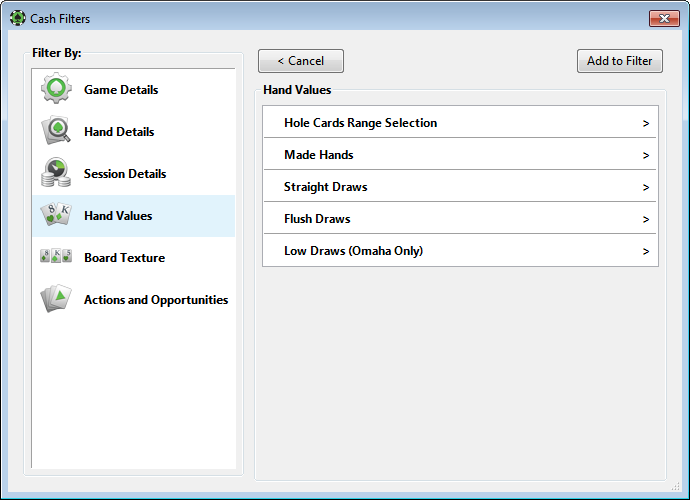 “Hand Values” Section is intended to create the filter using hand values. 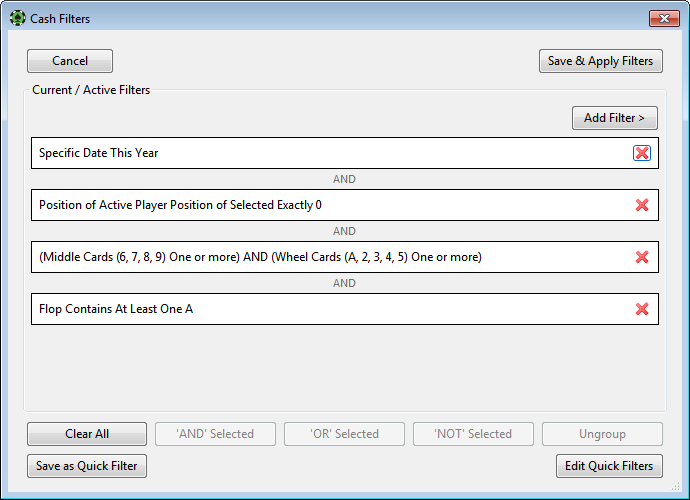 Here you can configure hand card for our filter. Were Flush Draws or Straight Draws on board or not, and etc.? For our example, consider how we played when we had two over cards. This is very unique situation, but very profitable. 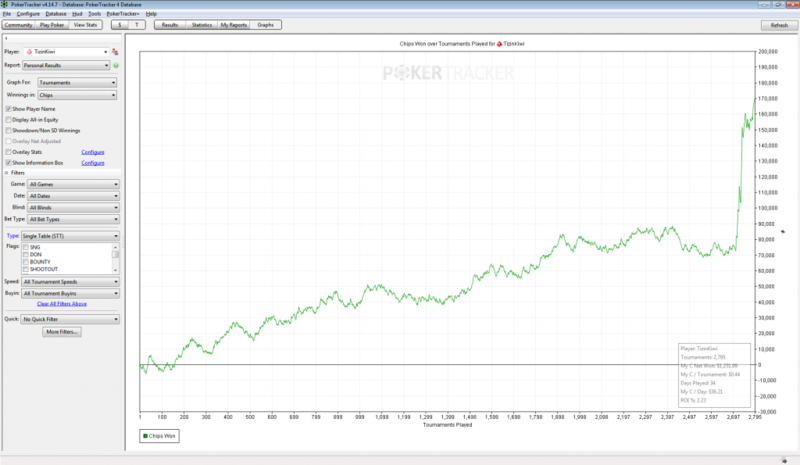 Here you can set up how the board was looking on Flop, Turn and River. 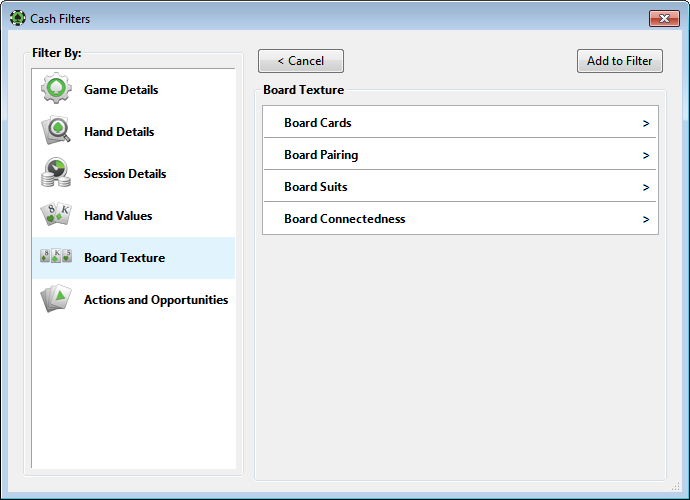 You can chose when the board was paired or not, and more others. For our example, let’s choose the situation when there was “9” on the board like the highest card. For this in “Board Cards” we choose “Flop”, set up “ON” for “Middle Cards” and “Wheel Cards” and make checked for each “Two or more”. Also, in our filter, besides “2”, “3”, “4”, “5” cards form “Wheel Cards”, hits “Ace”, which isn’t need for us. Let’s remove “Ace”. For this we’ll create one more filter. For this let’s go to “Board Cards”, choose “Flop” and in section “Flop Contains At Leas One” make click on “A”. Press “Add to Filter”. The following window will appear. There are Aces on the flop in our filter. To remove them, make click on our last filter, and press “NOT Selected”. Then press “Add Filter”. Ready. “Actions and Opportunities”. This section is intended for setting the actions that have been done. 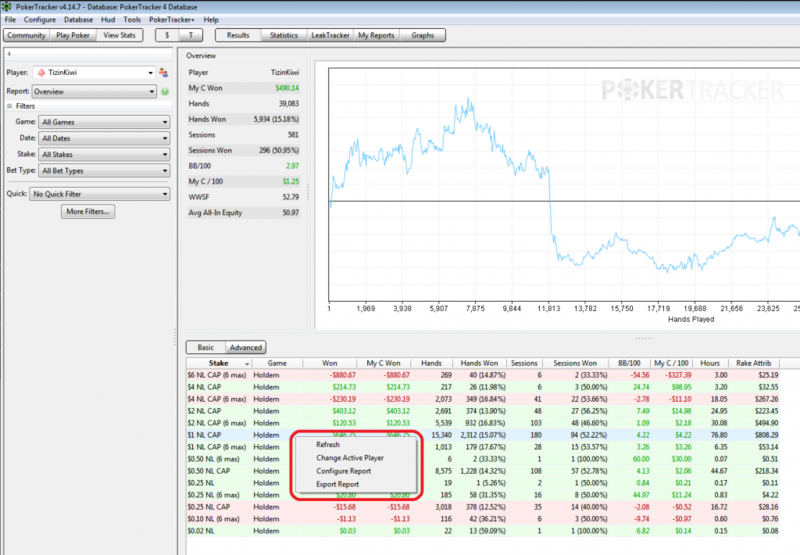 Also, for our example, I add from “Actions and Opportunities – Preflop” “Saw Flop”. After all of our options, we get the following window. There are available the advanced settings. “NOT Selected” we have already discussed. 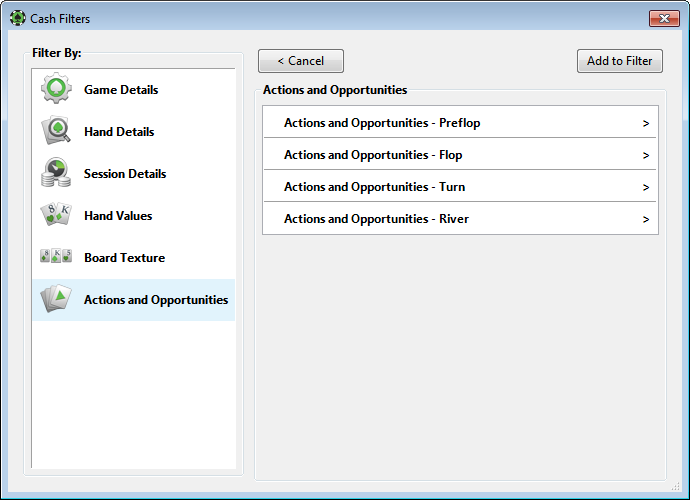 If you make multiple select of several elements, “AND Selected” and “OR Selected” become available. They set logic for our elements. But, for our example, we don’t use it. 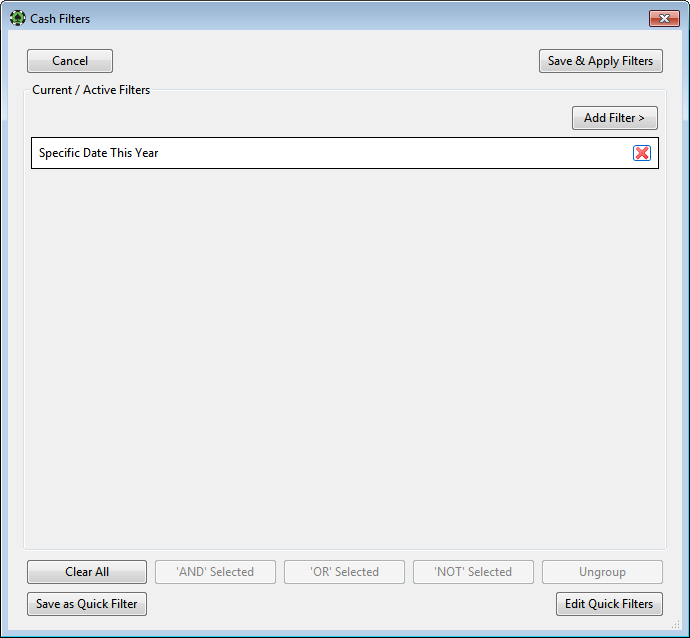 To save our filter press “Save as Quick Filter” in the left part of the screen. 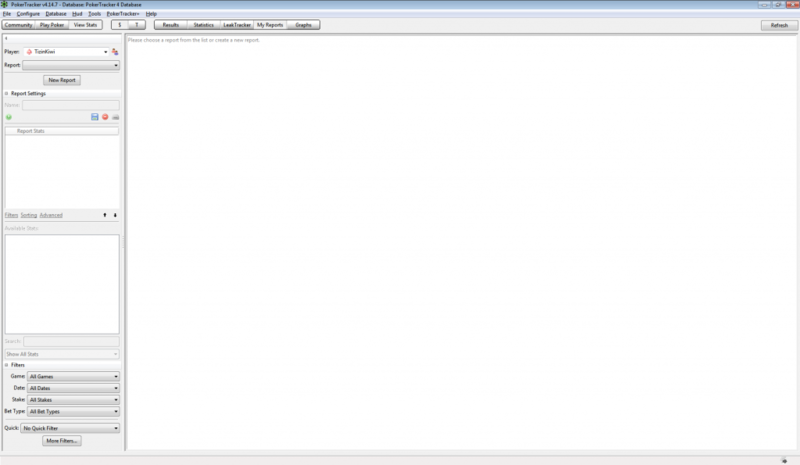 To apply our filter press “Save & Apply Filters” in the top right part of the screen. Now our filter works and its results are available in “View Stats” tab. Our filter became available in the dropdown menu. Also, the block with description of our filter is available under this menu. To clear all the filters press “Clear Filters”. By the help of “Quick filters” you can set up all situations, analyze them and improve you own game. In this section, you can create your own Poker Tracker 4 HUD. For this press “Hud” and in the dropdown menu choose “Edit Hud Profiles”. Let’s review all sections in popup window. Profile Dropdown menu. 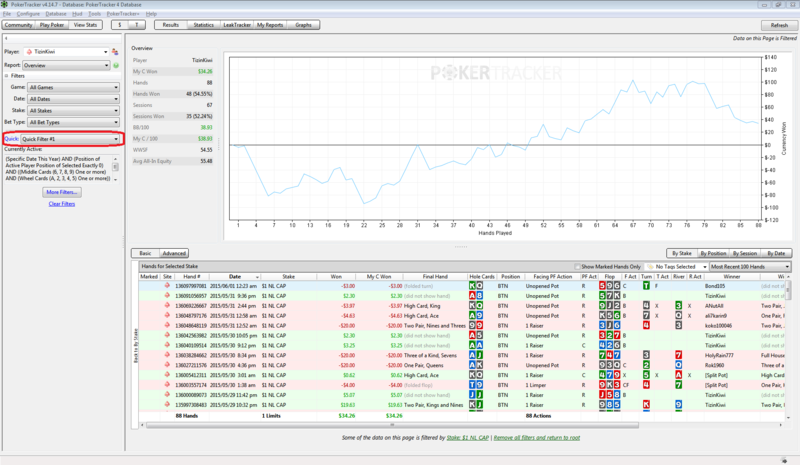 In this menu all existing nowadays HUD profiles in Poker Tracker 4 are presented. Button “Options” is intended to control the profiles. Press it and the following window appears. In this menu you can create “New Profile” from scratch. By the help of “Duplicate Profile” you can create new profile based on your existing profile. For example, you can use downloaded HUD profile. 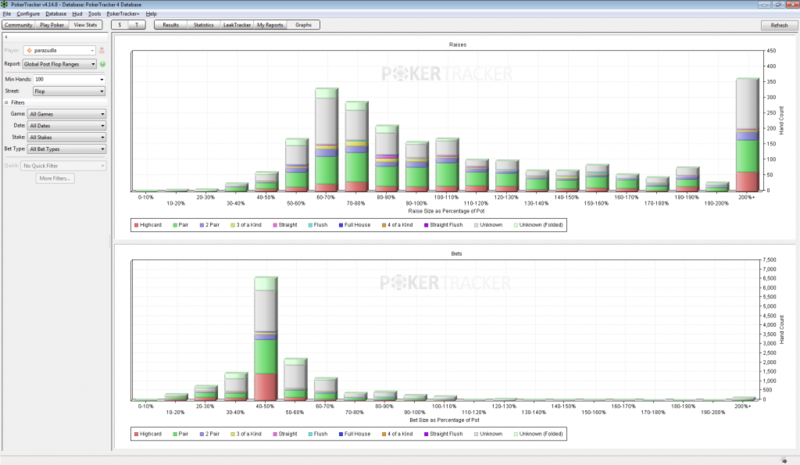 Poker Tracker 4 has its own HUDs base. To cross in it, you may use “Download New Profiles”. 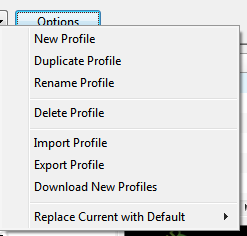 Here you can use “Rename Profile”, “Delete Profile”, “Import Profile”, “Export Profile” and “Replace Current with Default”. For example, You can choose “Duplicate Profile”, in the popup window enter name what you like and then press “OK”. Let’s review the sections situated below. In the top left part of the screen you can see button to control “Stats Groups”. You can create, delete, import and export groups. Groups are needed to merge stats. You can see two groups. “Player Stats” show stats displayed on the tables. In the “Table Stats” there are located overall stats for the table. You can invest your own stats groups. For example, one part of stats can display always, other part only when the mouse is over on the given area. You can tune this slightly to the right in “Group Properties”, in “Display Type”. Also, you can rename “Stats Group”, for whom it will be displayed: “Everyone”, “Everyone But Hero”, “Hero Only” or “Table Averages”. You can define “Separator”, “Padding” and “Arrange in Grid”, “Background color” and “Opacity”. After playing with these settings, you can get really awesome HUD. You can configure Popups windows for each “Popups Groups”, by clicking on the “Assign Popups” tab. A little bit righter “Group Items” are located, which display all stats of HUD in the usable list. 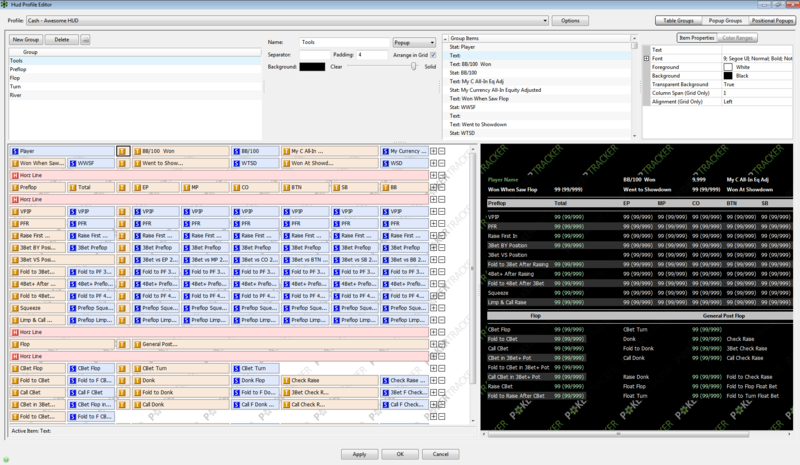 By clicking one of the stats, in “Item Properties” you can set up: “Font”, “Foreground”, “Background”, “Transparent Background”, “Decimals” – it’s useful for stats where standard number precision is not enough, “Show Time/Opportunities”, “Prefix”, “Suffix”, “Position”, “Alignment (Grid Only”, “Column Span (Grid Only)” and “Popup”. Also you can go to “Color Ranges” tab and tune color ranges for each stat. As you can see, some settings are repeated and the same things you can make different ways. It seems excessive, but it is done for convenience. When you will create complex HUS, you will appreciate it. In the bottom left part of the screen you can see stats. If you click on it, value in “Item Properties” changes. You can change it immediately. In the bottom part of the screen you can use the search by stats. In the dropdown menu you can sort your stats by “Show All Stats”, “Show Custom Stats”, “Show Premium Stats”, “Show Build-In Stats” and “Show Essential Built-In Stats”. You can buy or find Custom and Premium stats in Internet. 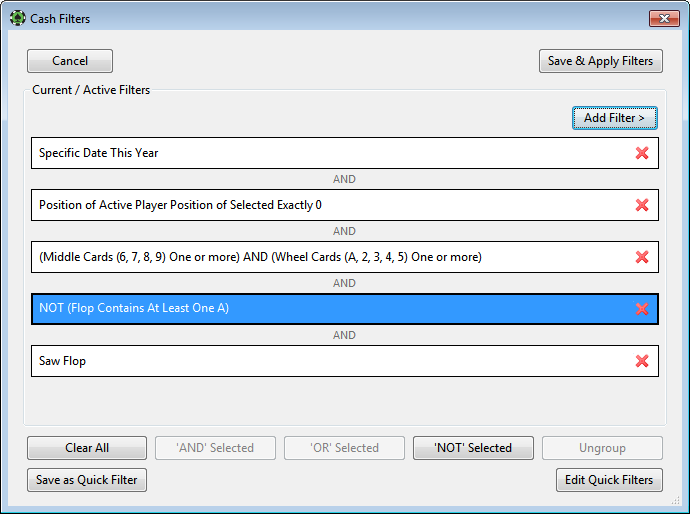 Also, you can create it by yourself, but it is quite difficult and requires great knowledges of the Poker Tracker 4 database. As well you can add the text with “Add Text” button, “Note Editor”, which is already on the first place in the stats list. “Add Horizontal Separator Line”, “Add New Line” add an empty line and a new line for stats respectively. In the bottom right part of the screen you can see visual display of our HUD. It is helpful to understand what happens with our HUD after our changes without opening “Replayer” once again. We dealt with HUDs, now let’s move on to Popups settings. For this press “Popup Groups” tab in the top right part of the screen. If you look closely, this window is not different from the previous one. Now, as “Stats Groups” act “Popups”. Popup it is huge “Stat Group”. The only difference is several removed fields in the “Item Properties”. “Positional Popups” is the last tab in this section. As in the previous window you can create popups. But here, you can set up positions for each popup. For this you have to remove “check” from unnecessary checkboxes. Also, you can set “Display Percentages Makeup”. After creating your popup, you can also click the “Convert to Freeform” button to make your current popup available for edit in the Popup Groups page, this will allow the using of the drag and drop interface. Now we turn to “HUD Options”. For this press “Hud”, then press “Edit Hud Options” in the dropdown menu. In the popup window all settings are divided into several sections. 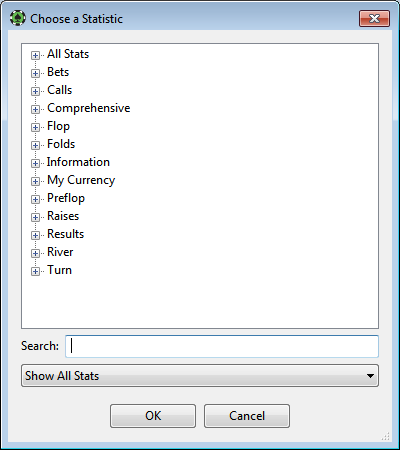 In “General Settings” in “General” Tab you can set up various filters such as “Minimum Hands Requered” and set minimal amount of samples, “Stats From Current Cash Stake Only”, “Stats From Current Bet Type Only”, “Retrieve Session Stats for Tooltips”. 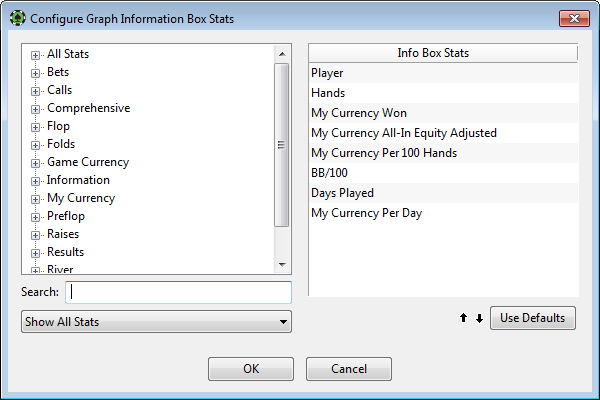 Also you can set up “Stats from the last X hands” or “Stats from the last X weeks” do not to use too old statistics. Below, you can filter statistics in accordance with number of people on the table. In “Mucked Cards” section you can set up mucked cards visibility, display time and opacity. 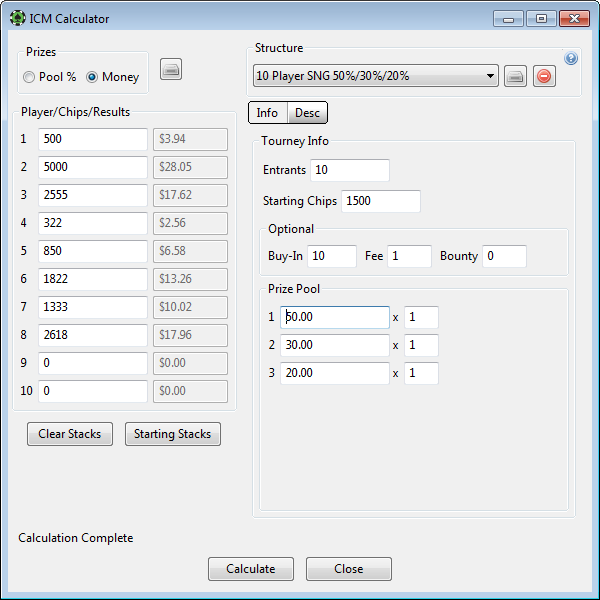 “Tournament Stacks” section is designed for strict display of stats for certain stack. 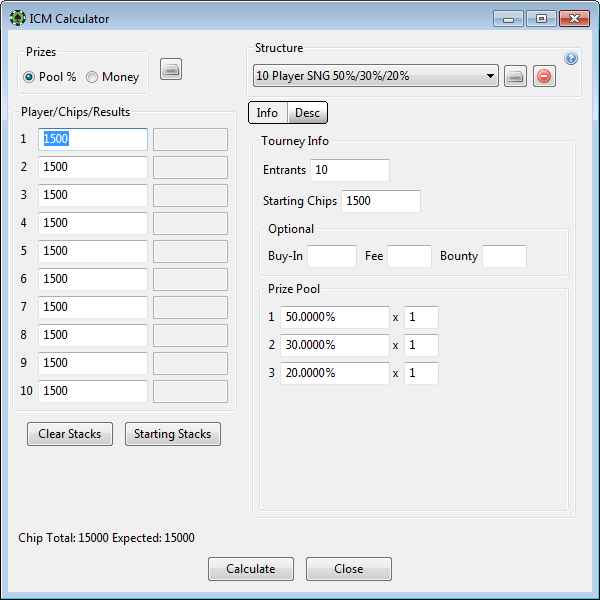 Depending on the type and speed of the tournament, different values may be convenient for the same size of stack. Play with dropdown menus and adjust them as you think it is more logical. “Refresh Rates”. This section is required only for custom stats. “Advanced” Tab from the top right corner of the screen shows next. 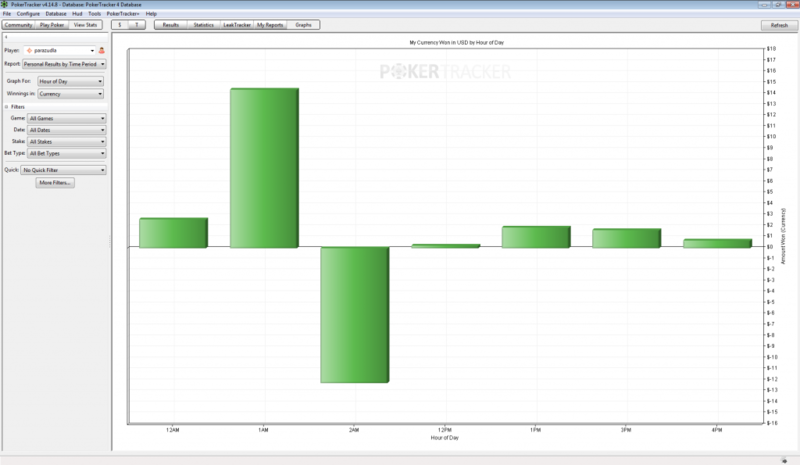 Here you can switch between you Databases from which Poker Tracker 4 will draw data. I have only one database at the present moment. In “Hud Display Options” you can configure additional parameters of displaying HUD, which have not been previously configured, such as “Outline Groups with Player Color”, “Lower Opacity” and etc. In “Profile Select” tab, for each “Site”, “Limit”, “Speed”, “Game”, “Seats”, you can set up your own profile. 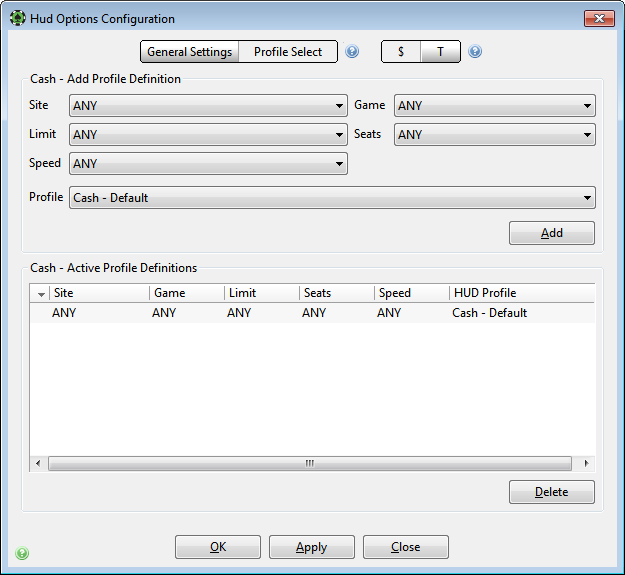 For sure, you already use different HUDs for cash and tournaments games. But, for example, for “MTT”, “SnG” and “Spin and go” we need completely different HUDs. Here you can set up it in “Cash” tab. Tab “T” will move you to tournaments settings. 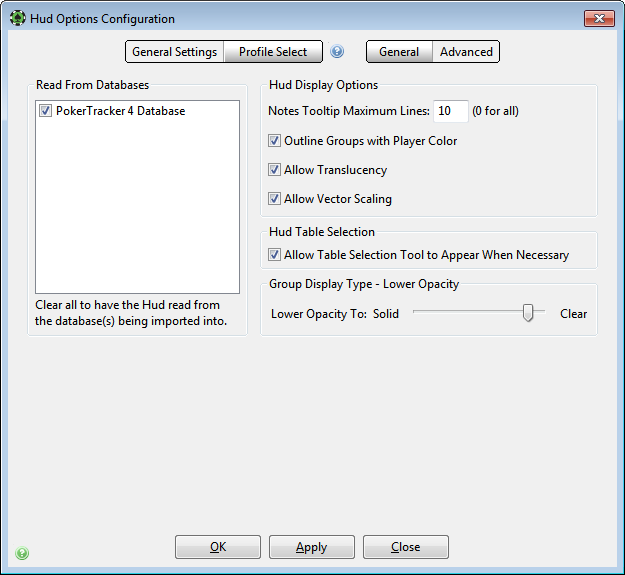 Now, knowing the aforesaid HUD settings you can configure your HUD like you want, removing all unnecessary and adding the missing details. 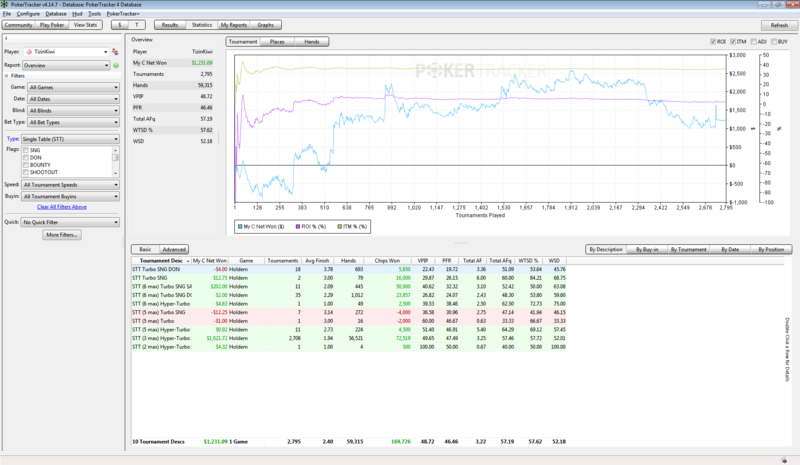 Leak Buster – Use PT4 and all of your current online poker data to analyze and repair your poker leaks with Leak Buster. 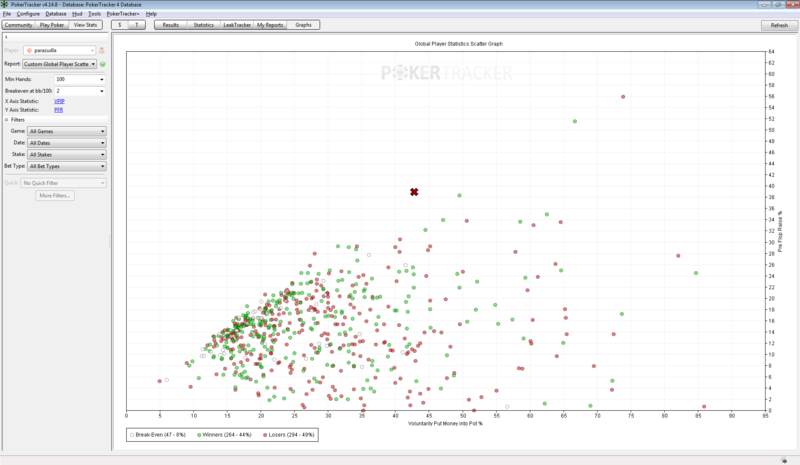 Leak Buster is a poker stat analysis software that will analyze every aspect of your poker game and help you repair those costly poker leaks. “View Stats” tab also is used for the analysis of the tournaments games, which we have previously considered. If you have not read this part, read it, because everything is very similar. Instead of “$” tab we have to use “T” tab. 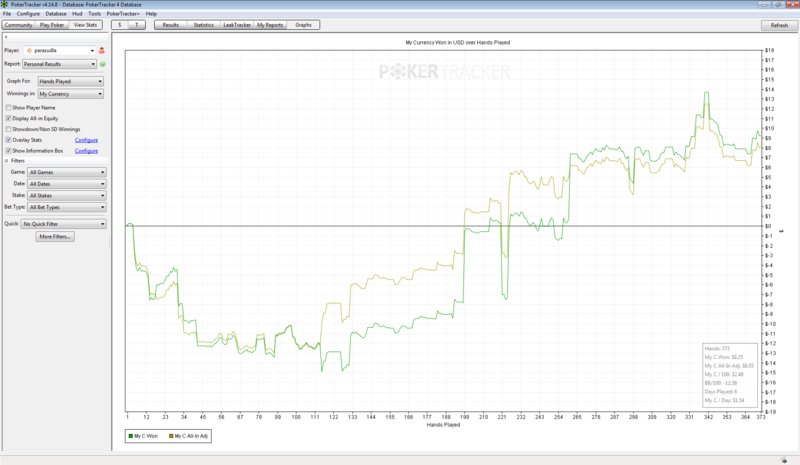 Let’s look at the differences between Cash and Tournaments games. 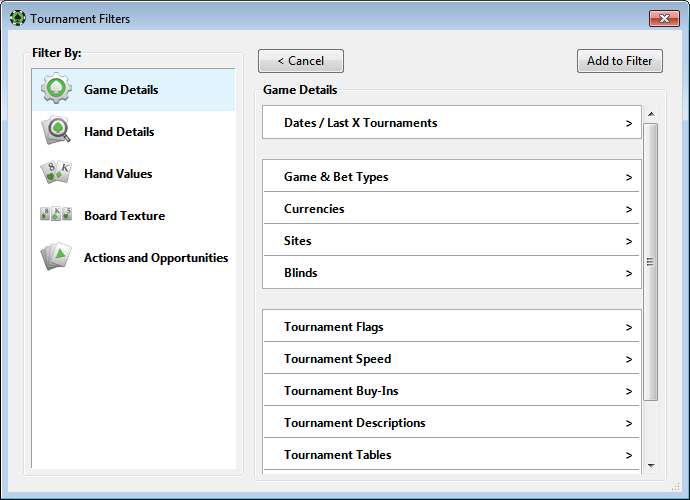 On the left side there are new filtering capabilities, such as “Tournament Type” where you can choose “Single Table (STT)”, “Multi Table(MTT)” or all tournaments. 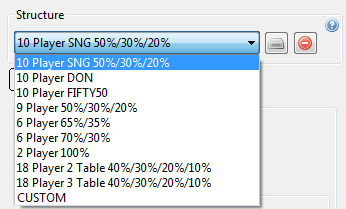 You can choose “Flags”: “SnG”, “DON”, “Bounty”, “Shootout”, “Rebuy”, “Fifty50” and others. Also you can set tournament “Speed” and “Buy-In”. Also, you can edit tournaments results by the help of “Edit Tournaments Results” button. In the popup window you can choose tournament and edit it. For example, you can change “Buy-in+Fee”, “Rebuys” time or the place where you finished in tournament, if there is some mistake in the Hand History. You can apply the additional filters for fast tournament search. For this press “Filters” button. After all changes press “Save” button. Let’s select the report “Overview” and consider it. Also, I put “Single Table (STT)”. In the right part of the screen “Tournament”, “Places” and “Hands” tabs are available. 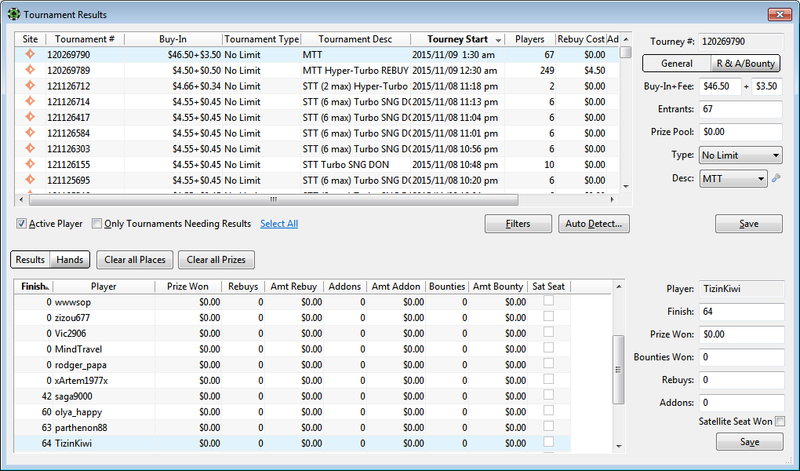 “Tournament” tab is useful to tack “ROI %”, “ITM %”, and “My C Net Won ($)”. This is a very important for the tournament players of all tournament types. 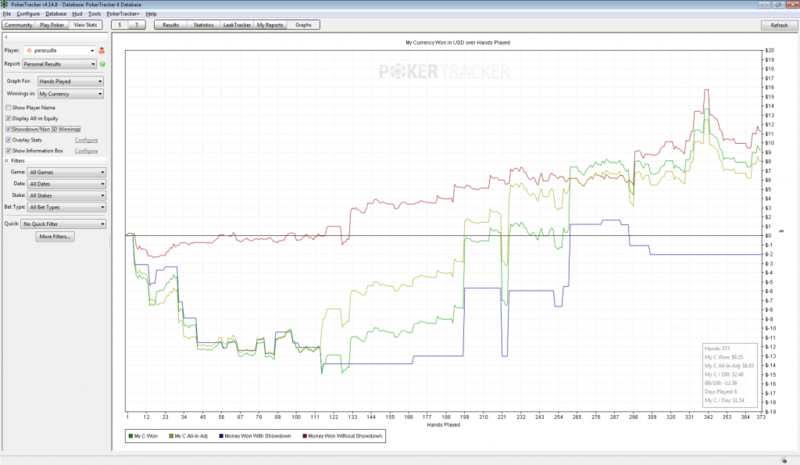 “Places” tab is comfortable for “SnG” players, you can see the distribution of prizes. In “MTT” it’s not so important, because it’s very small data retrieval of samples. Tab “Statistics” differs from “Result” by the absence of the “Edit Tournament Results” in the left part of the screen. “My Reports” Tab is designed for creating own filters, but it is beyond the scope of our review. Tab “Graphs” is designed for even more graph settings. 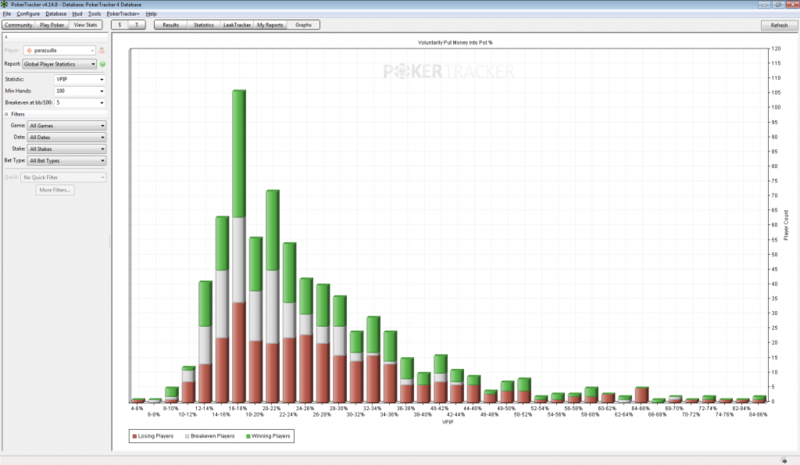 Poker Tracker 4 is a powerful tool for analyze hand history. 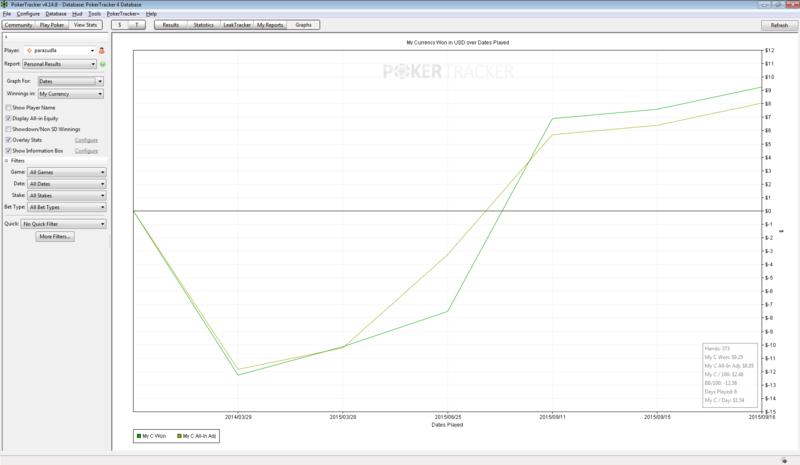 He concedes presentable Holdem Manager 2 reports. But at the same time wins in custom stats configuration. Study theory, experiment and grow!